At Christmas, I made a cute oyster shell ornament for my tree. However, some of the oyster shells I had were a bit too big to hang onto the tree. I kept them to one side and used them to make some handmade candles. It’s amazing how glamourous an oyster shell can look once it is spray painted gold. The big shells look even more fabulous spray painted and used as candles on the table. 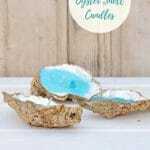 These handmade oyster shell candles would be a lovely gift for someone. Whether as a housewarming, dinner party or even a birthday gift. They are a unique gift for very little cost. The only cost really is for the wax and gift wrap. If you repurposed old candles, you could make them for almost nothing. 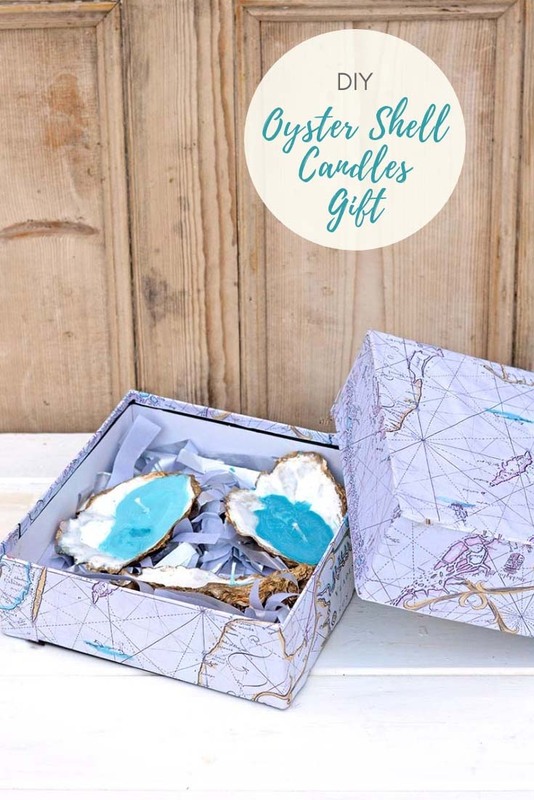 To make the gift even more special and to keep with the seaside theme of the handmade candles, they are presented in a DIY nautical themed gift box. 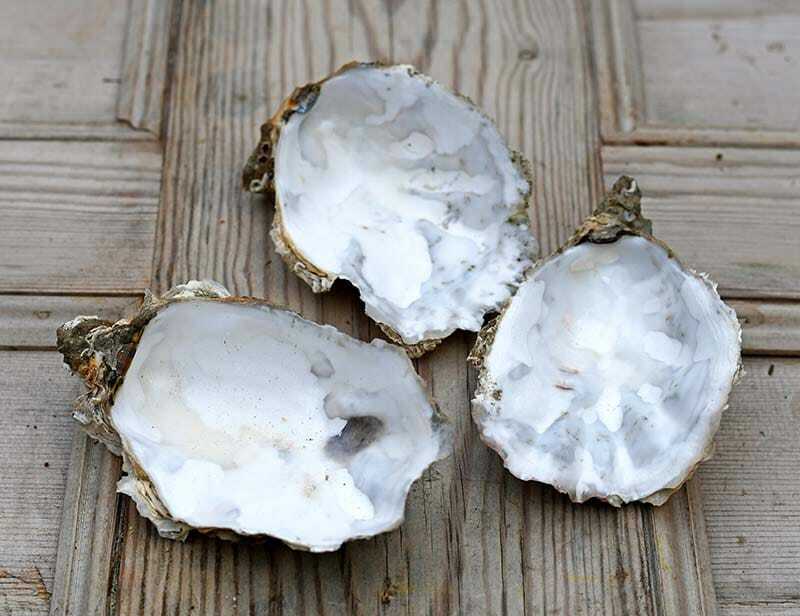 Large oyster shells – Ask your local fishmonger or restaurant. If that’s not possible I bet there is someone selling them on eBay! Old cardboard gift box large enough to fit the candles in. 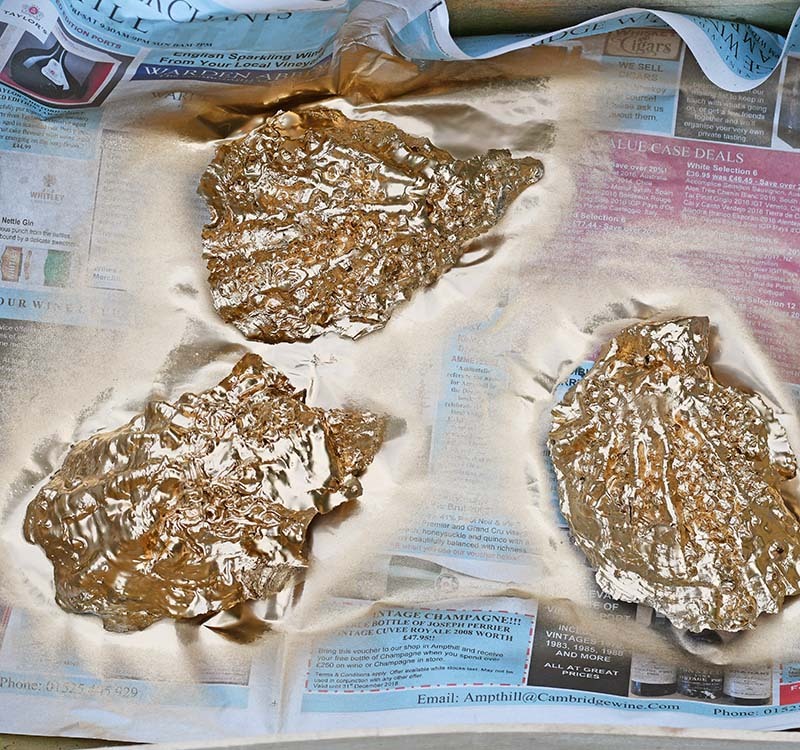 The first thing I did was to spray paint the outside of the oyster shells gold. 2. Next, I worked out roughly how much wax I needed to fill make the handmade oyster shell candles. To do this is I filled each shell with water and then tipped this into a jug and measured the amount of liquid. 3. 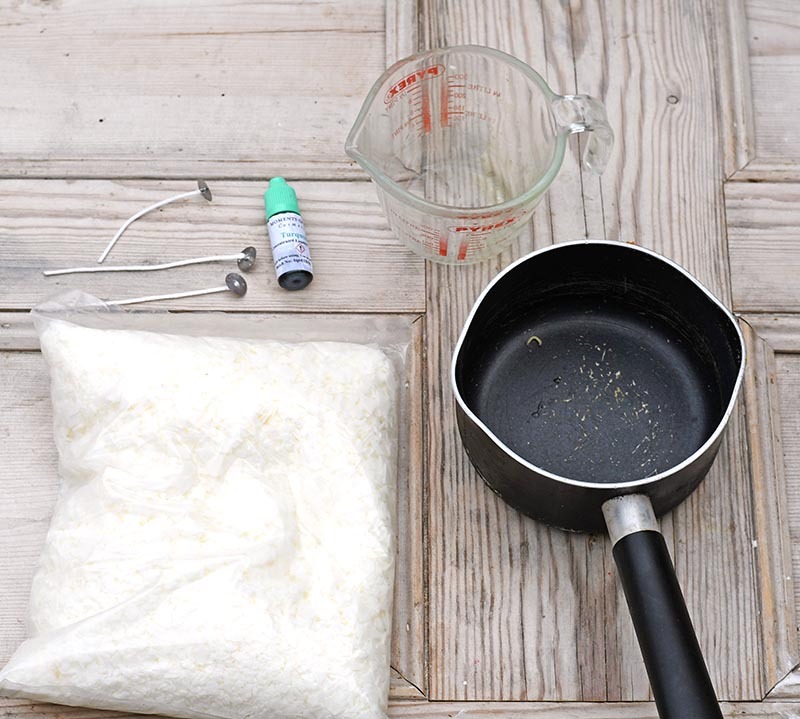 To melt the wax to make the handmade candles you will need a “Bain Marie.” That is you don’t want to melt the wax directly as it is a fire risk. 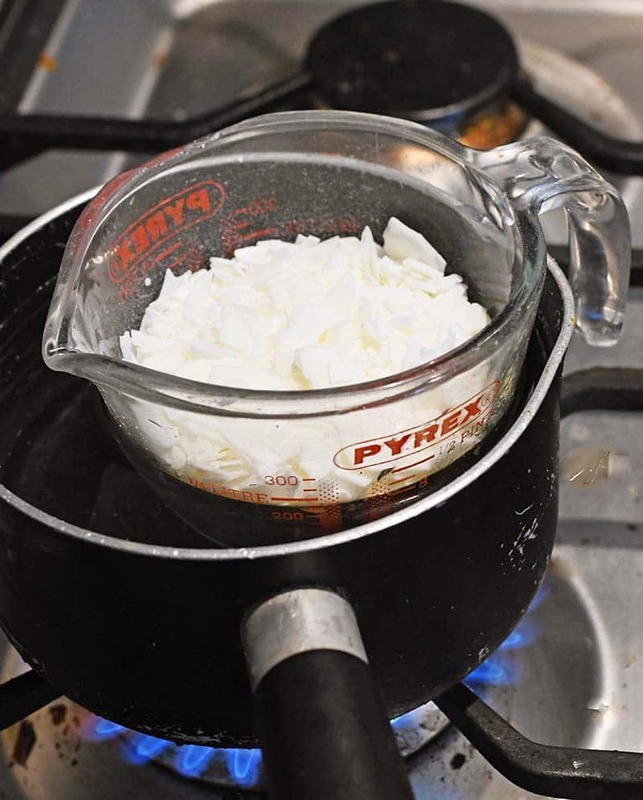 To make your own “Bain Marie”, put the wax in a pyrex jug/bowl and then place this bowl over simmering water in a saucepan. This is the same method you would use to melt chocolate over a stove. As soon as all the wax has melted (it will go clear) add a few drops of dye if you want to colour your candles. To keep with a seaside theme I dyed my wax blue. You can also add a fragrance oil at this point if you want smelly candles. 4. 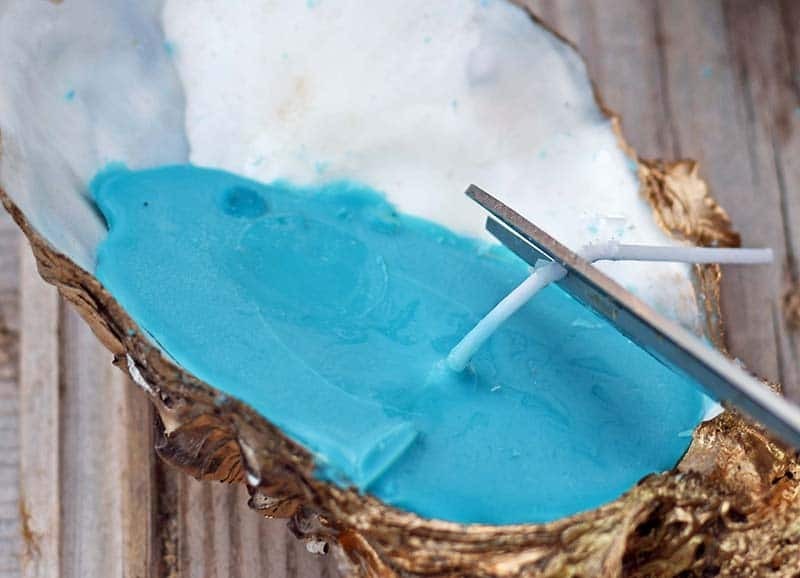 Next, carefully pour the molten wax into the oyster shells. 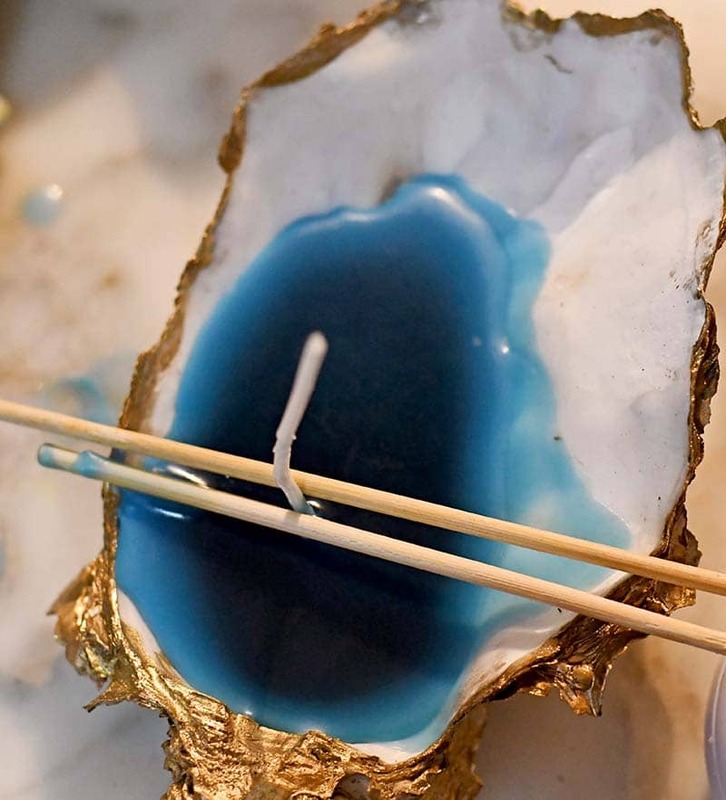 Place a wick in each shell and use two wooden skewers to hold it upright as the wax cools and sets. 5. Leave the handmade candles a good couple of hours for the wax to harden. Once the wax has set cut the wicks down to size. 6. Finally, as these candles are a gift, I made a lovely presentation box for them. I simpley covered a cardboard box with nautical map wrapping paper and laid the oyster shell candles on top of shredded tissue paper. These handmade candles would look fabulous as a center piece on the dinner table. Even though I have made these as a gift, I will be keeping some myself for the next time I cook a special dinner. If you liked this post you should check out my scallop shell trinket dishes. Keeping with the seaside theme you may like my repurposed denim fish pillow. Five of the Best Upcycled Mother’s Day Gifts . Thank you, yes very natural. 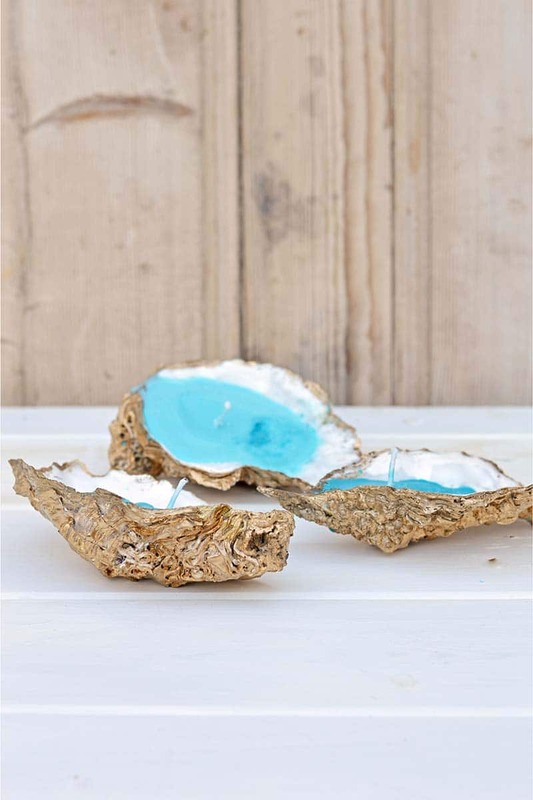 What a brilliant idea on how to reuse the shells, I would love to make my own candles. Do you put essential oils for the scents? Thank you. Yes you can add essential oils for scent. Claire that is one beautiful candle. I can imagine it being done with all sorts of seashells too. It’s too bad I’m not in Greece anymore where they were plentiful. Thank you. I miss being beside the sea too. You’ll have to pick some up next time you visit. Aww, thank you and thanks for the shares. I love the combination of rustic and elegant in this fun gift idea! Thanks for sharing at Vintage Charm–pinned! Thank you, Cecillia. 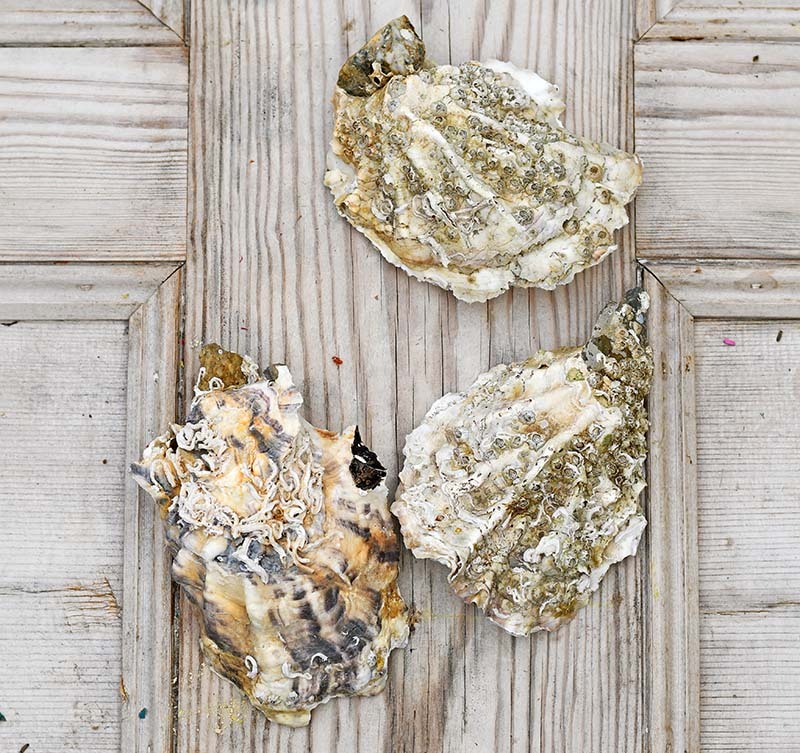 Yes the gold paint looks lovely on the gnarled shells. These are sooo pretty! I wouldn’t even burn, them I would just leave them for some pretty decor! Thank you, Linda. They would look good as the tea lights you use for hot plates on the table. These are so cute and make me think of summer and beaches. A great thing to have around to help with the winter blues. Thanks for sharing. Thwnk you. Yes they have a beach feel but with a warm glow when lit. Thank you. They do look good on the dinner table, I’m going to save mine for next time I have guests. What a fun & cute gift idea! Very creative! Thanks for sharing at Merry Monday! Thanks, Michelle. It’s amazing how a bit of gold paint can make something ordinary look glam. They sound like fun. I’d love to see that blog post.